During your geography examination, you might be asked to identify some important river features on a map. We would strongly advise that you start looking at maps as quickly as possible to prepare yourself for your exam. If you are asked to identify river landforms on a map, then you could be in for quite the challenge. This is because different landforms can be found in upper courses and lower courses, meaning that you need to consider two different sets of evidence. If you can tell that you are looking at the upper course of a river on a map, then you will know what landforms are more than likely going to be present. You can usually spot the upper course by looking for lots of contour lines, these show us that the land is steep. It is quite normal to see waterfalls in the area around the upper course and a lot of these are marked. If there doesn’t seem to be a symbol, then you could also look for a cliff symbol and close contour lines, as these could possibly point to the presence of a waterfall. The same goes for river landforms that can be found around the lower course, where we usually know what to look for. Most of these areas have very few contour lines because of how low the nearby land is, and the river tends to be quite thick when it reaches the lower course. It is normal to see ox-bow lakes and meanders in these areas and you can also spot flood plains if you know what to look for. 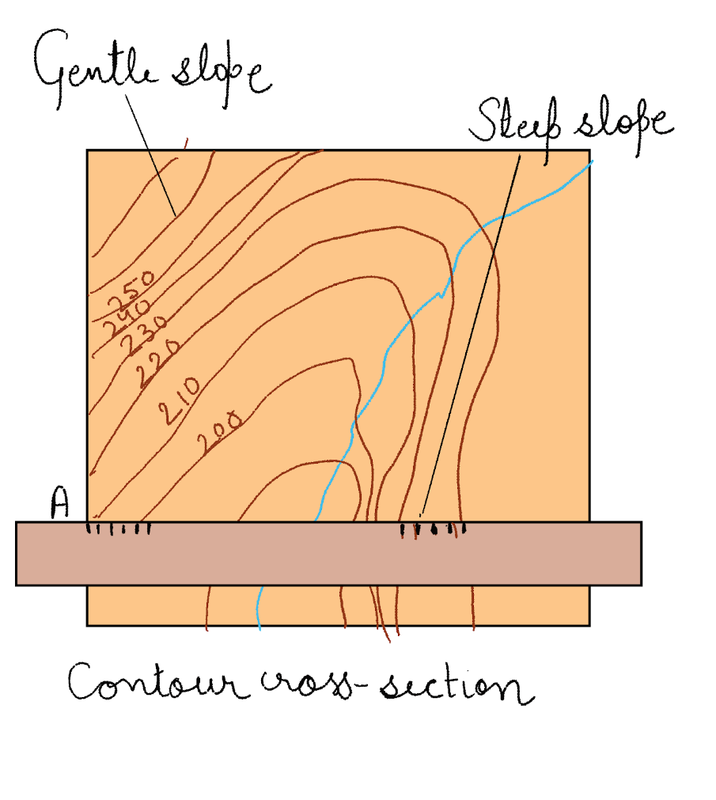 The long profile Geographers divide a river and its valley into the upper, middle and lower course. A river’s long profile shows the height and distance downstream from the river’s source to its mouth. It is a curved shape, steeper near the source and flatter near the mouth. The source of the River Dee is 460 metres above sea level on the slopes of Dduallt in Snowdonia National Park, North Wales. Here the average annual rainfall exceeds 3000 mm and runoff is high from the steep upland slopes. The geology is mainly hard igneous rocks, which are very resistant to erosion. Near the source, the channel is narrow, shallow and full of angular stones, so friction with the bed and banks slows the river down. In the upper course the river erodes vertically, cutting down into the landscape and forming a V-shaped valley with steep slopes, where processes such as sliding and slumping take place. As the River Dee leaves its upland area and flows downstream, the valley becomes wider and flatter, creating areas of flood plain, and its gradient decreases. The river now erodes sideways through lateral erosion as well as downwards, and there is some deposition, for example on the inside bends of meanders. Sooner or later the sediments will be eroded by the river again, so they become smaller and more rounded, and transported further downstream. As more tributaries join the River Dee, its discharge increases. The lower course In the lower Dee valley, the climate changes, with average annual rainfall less than 750 mm. The river flows through softer rocks, such as sandstones, towards Chester. Lateral erosion creates a wide valley with a flat bottom. The river channel also widens. Because it is deep and smooth, there is less friction with the river bed and banks, so the river’s velocity is greatest. More tributaries increase the Dee’s discharge. Here, lateral erosion and transportation continue and the muddy river water shows its sediment load is high. This encourages deposition, for example at the river mouth in the Irish Sea between Wales and the Wirral Peninsula. This part of the river near Chester is called the estuary because it is affected by tides. Contours are lines joining places of equal height above sea level. They also tell us how much the land slopes. Contours that are close together on the map show where the land slopes steeply. Contours further apart on the map show gentle slopes. Areas with few contours, or none at all, are flat: there is little or no gradient. 1. Choose where you are going to make your cross section. Place a strip of paper across the contour lines on the map. 2. Mark on the strip of paper each place where a contour line crosses it. Label the heights of the contours on your paper. 3. Make the horizontal axis the same length as your strip of paper. 4. The vertical axis is the height of the land from the lowest point to the highest point on the cross section. 5. Use the information on your strip of paper to plot the heights on the graph paper.